Panel: The context in which Blogging and Citizen Media takes place in Chile. This was blogged trying to keep up with the spanish translators so please excuse any information that is missing. Yo ucan add anything in the comments section. All the panelists are involved in the use of new technology for freedom of speech. Worked in Analysing the possibilities of new Technologioes for citizen participation, always been a passionate user of Social Networks. Interested in how the new networks impacts the way society moves. Interested mostly in Chile, but there is no real research showing the consumption of SM. There are 6 million profiles on Facebook in Chile. Twitter has grown significantly in Chile, and has to do a lot with show business and the press. 100 000 twitter profiles were created last year. The election and the earthquake contributed to this. The press has become the owner of this and open TV programs and News programs used Twitter. Even the anchors used Twitter, which encouraged many others to become users of Twitter. I've told my twitter followers that I'm interested in how social networks affects them in Chile. – We're discovering there is something beyond the mountains and the sea – we need to leave our footprint. – We are culturally shy and prefer to express ourselves through mediums where we don't have to see each other. – There's a taste for being famous and being on TV. – This has to do with mental illnesses OCD – some bloggers are exhibitionists. Chilean people are schizophrenic, we're a bit shy but we all want to be famous. Internet is not a library but encouraging people to be more democratic and also a tool for generating money. The challenge we face is to conclude this year and grow next year into other places across the world. Working on a project called “The Fifth Power”, which has been recently launched. Chile appears as a phenomenon of how SM have expressed themselves. 50% of the population interact with the web. 33% of households in Chile have Broadband. There is critical mass of the population who are connecting to the web to use the internet in different ways. Facing htis scenario: the problem Chile has with bandwidth. The cap relates to State policy, we need an initiative to establish the digital environment. There are various companies giving subsidies in order establish this but it is very cumbersome and troublesome to implement across Chile. Finance not only restricted to developing hte web but schools as well, getting htem connected to social media. E-government: many citizens do all the various governmental functions online e.g. Tax Collection. 95% in done in the month of April. The Public procurement system is done on-line as well. NGO's use Social Networks to communicate which is different from the way they used to operate. The way to participate with NGO's is till something that needsto be addressed. In the case of the earthquake we have seen the different ways in which citizens engage with NGO's. NGO's have their web platforms but hte information is publiushed from the top-down. There isn't much information published through Twitter, etc. They continue to use old methods and haven't embraced new methods. This is the challenge NGO's face currently. 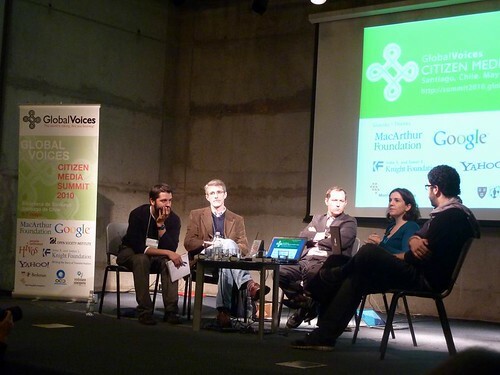 The Intelligent Citizen foundation – Google search “transparency” – this is still the concept that is widely used in Chile – The society demands more information. This demand has been covered somewhat by different entities e.g. some South American countries have implmented Transparency laws. Citizens have responded to the need for more transparency and GV is basically doing that – diversifying the sources of information. But also we need to diversify the information we have and NGO's are responding to this. For NGO's to participate in public life, they need more information. The Intelligent Citizen Foundation is promoting greater transparency amongst government and market departments. We have created a platform – votainteligente.cl – for monitoring various things like the members of parliament so that citizens can know what the politicians are talking about on topics such as voting, congress, etc. so that citizens can participate in public life with more information.